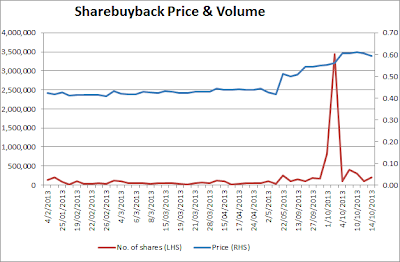 Stocks Unleashed: Insas (RM0.645; Target Price: Too undervalued): Super duper cheap, riding on Inari...and potential corporate moves (Just guessing)? Insas (RM0.645; Target Price: Too undervalued): Super duper cheap, riding on Inari...and potential corporate moves (Just guessing)? 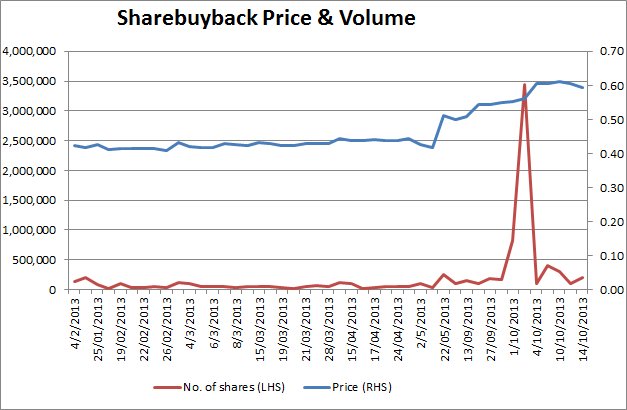 A stock that is too cheap to ignore and huge earnings prospects from its new venture into IT-related business. Financial services and credit & leasing: Stock broking and dealing in securities, provision of corporate finance and advisory services, credit and leasing and granting of loans and other related financing activities, provision of share registration services, management services and nominee agents. Property development, property holding and investments and project and property management. Investment holding and trading of quoted securities and other related financial instruments. Retail trading and car rental: Cars and limousines for hire/rental, wine merchant, retail and trading of high fashion wear, leather goods and other lifestyle-related products and operating food and beverages outlets. Tech: Produce wireless microwave telecommunication products, wireless broadcast card and electronic manufacturing services, design, manufacturing, distribution and sales of smartcards, semi-conductor products and equipment, manufacture and distribution of computer peripherals, design and development of software and web applications and provision of communication and networking services, provision of sales and services for mobile wireless and fixed line broadband solutions and devices and related peripherals, sale of data and multimedia products and services, computer hardware dealers and maintenance, sale of multimedia and electronic products and IT consultancy services. Properties: Can easily reach RM200mil. Book value at RM179.335mil (It will be worth much more since around RM50mil worth of properties have not been revalued for more than 15 years and another RM10mil worth of properties not revalued since 8 years ago). 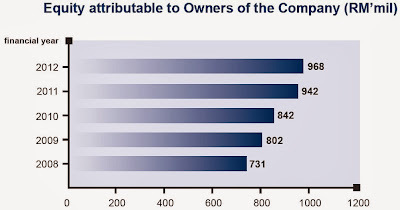 The total assets listed above is around RM930mil. 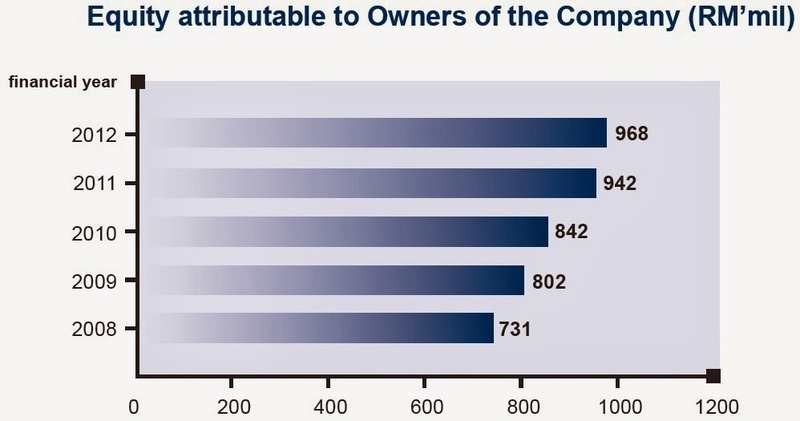 There are other associate companies which I’ve not included yet such as 20% stake in Gleneagles Medical Center SB and 43.4% Melium Group (Dome cafe and fashion retailer for over 30 world famous brands including Etienne Aigner, Hugo Boss, Christian Lacroix, Cole Haan, Emilio Pucci, Ermenegildo Zegna, Furla, Mauboussin, Stuart Weitzman, Tod’s and +IT). Earnings were largely determined by Insas’ investment holdings and trading of financial instruments which have volatile earnings. Thus, overall earnings were volatile and inconsistent historically. However, IT-related manufacturing and trading segment (mainly from 36.44% of Inari’s earnings) seems to be increasing q-o-q and will likely provide consistent recurring earnings to the company in the future. Thus far, similar to what Intellecpoint mentioned in his blog post on Insas (click here), the boss managed to increase shareholders’ equity over the past years, but maybe not enough to optimize shareholders’ value to the fullest. So, now the question is, how will Dato’ Thong Kok Khee help Insas’ share price to rise? Perhaps he could give more consistent & higher dividend payout (It gave out dividends for the first time early this year at 1.3sen per share, ~2% dividend yield), share dividend (One was done early 2010: 1 share for every 25 shares held, equivalent of 4% dividend yield. ), making Inari into subsidiary (It has been buying up Inari aggressively over the past few months), consolidating its businesses by selling non-core assets since his assets are so diversified. Perhaps he should just consolidate Insas’ businesses and put its humungous financial resources into expanding into retail, properties and IT which have huge earnings potential. Insas has been riding up together with Inari. 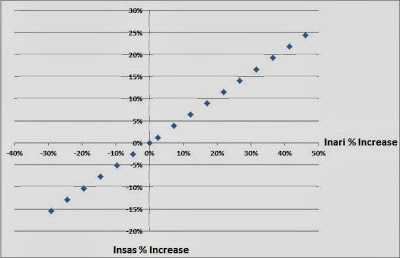 I’ve done a sensitivity analysis based on Insas’ 36.44% stake in Inari. 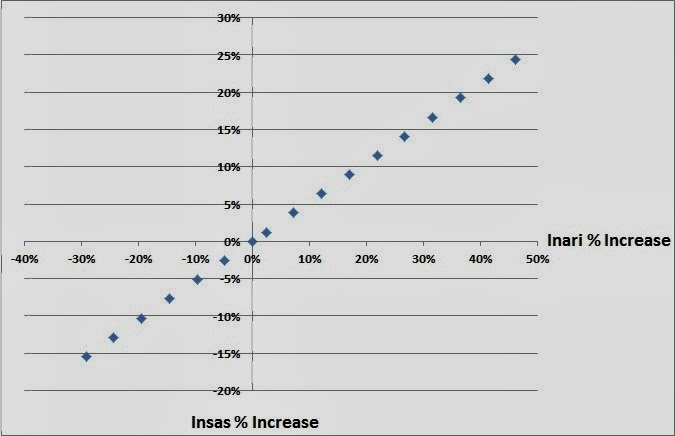 For each % rise in Inari share price, Insas share price should rise approximately 0.53%. Looking at Inari’s business of supplying assembled RF chips to Avago Technologies which is a market leader in the RF space and also Inari’s major customer, Inari’s earnings prospects are enormous as RF chips are incorporated into all major smartphones and tablets which are experiencing huge growth. 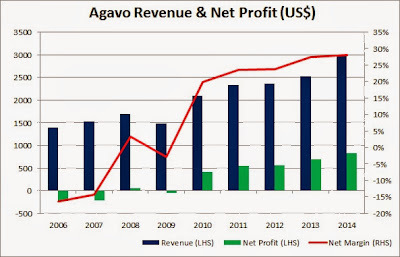 Just look at Avago’s earnings which have doubled since 2010. In addition, Avago holds 9.7% direct stake in Inari and is heavily dependent on Inari for its wafer processing as well as assembly and test in the wireless segment (Click here for Inari’s initiating coverage by Affin). 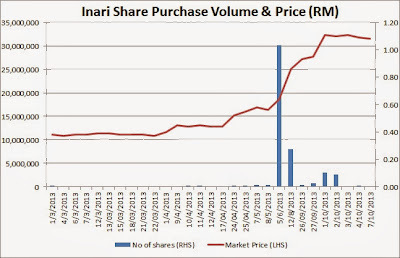 I believe Inari’s share price could surge even further (Just look at MyEG, gosh!!! And its market is just Malaysia!!!) as it is exposed to the global tech market and should trade at PER 16x to more than 20x. I will leave Inari for another post. Severely undervalued: Market cap of Insas is just RM425mil while its NAV is a huge RM1.03bil. 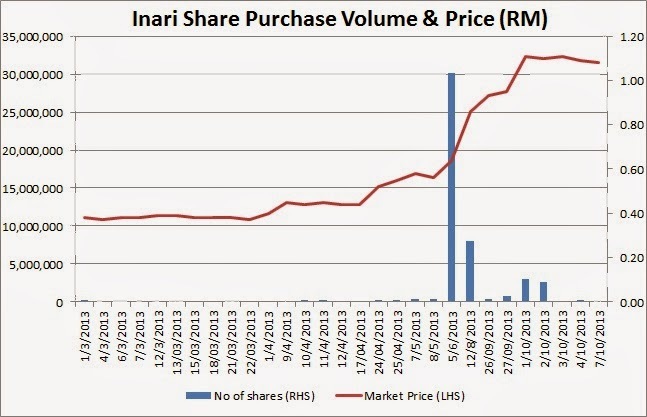 There is very limited downside to the share price due to severe undervaluation, but plenty of upside riding on Inari as well as potential corporate moves (Assets sales, consolidation of businesses, declaring cash/share dividend, JV/collaboration between Ho Hup and Insas’ property division?). 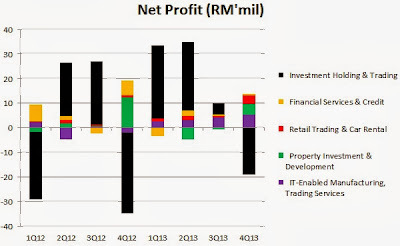 Dato’ Thong recently bought into Ho Hup, Formis and Inari aggressively via Insas and himself while at the same time Insas was buying back its own shares. What is he up to? Maybe just for trading? Or something more? If he could just start some corporate moves to realize some of its assets, the stock will rerate upwards quite substantially. It has been stuck below 60 sen for the past 10 years, is this the time to break out? What to buy? Investors could buy both of these shares with Insas being undervalued with a higher margin of safety (acting as a safe base) while Inari could provide higher growth. Currently, both of these stocks are super duper hot. I just feel like there’s something going on, perhaps some big contract wins by Inari OR Insas having some corporate moves or declaring dividends OR big players plus everyone else are entering this counter in view that the fundamentals of this company keeps getting better with its venture into the huge global tablets and smartphones market? Time will tell. Happy investing! All the best! For Insas your research and charts are so professional and indepth. I like it.